‘If you want to go fast go alone, if you want to go far, go together.’ African Proverb. One lone wildebeest wanders around snorting, cavorting and indulging in the odd blade of red grass. He’s skittish yet surprisingly feisty and fearless. He approaches the vehicle with a confident and somewhat rambunctious attitude. He’s the first, in fact, he’s winning the race. Perhaps not a race that you want to win though, when the closer you are to the front, the hungrier the crocodiles and other predators are! Only a few minutes pass and slowly from the whistling thorns around him, his friends and compatriots emerge. It’s not long before the snorting takes over entirely and we can’t even hear ourselves think. 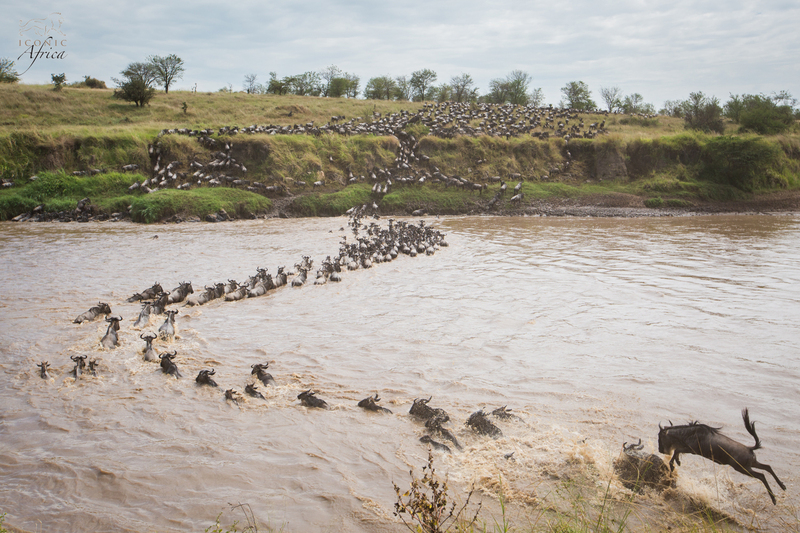 We sit hidden in a clump of acacias a few hundred metres from the mighty Mara River… hoping against all hope… that today would be the day that we would witness a crossing! More and more of them gather in loose yet visible batches of twenty or so. We watch a little more intently and quickly it becomes obvious. The batches of twenty are the females who are being unashamedly herded into smaller and smaller circles by the males performing some kind of protective dance. 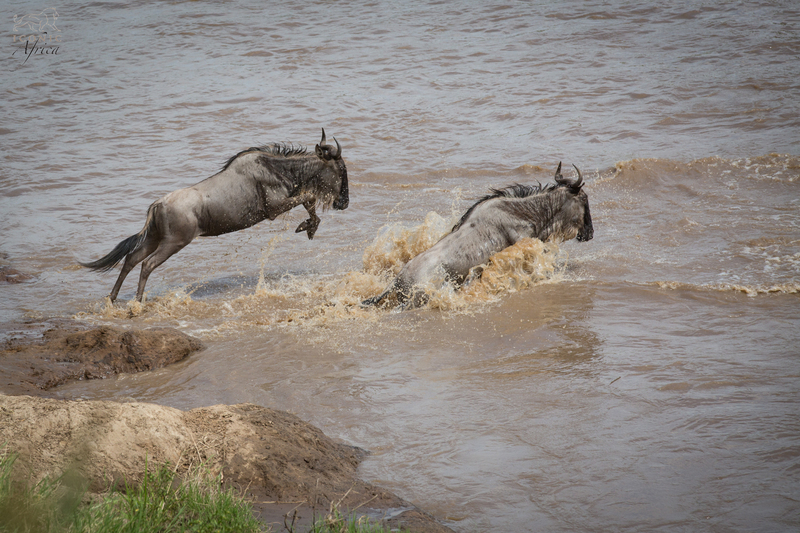 Sometimes referred to by the locals as the ‘Wildebeests Honeymoon,’ it’s mating season for these guys, and in a completely selfish manner they want to keep the best selection of females for themselves. They have no intentions of sharing and as a result fights break out between the males constantly. Horns raised they go full tilt at each other relentlessly. You can hear the horns crash together as they mark their territory and defend their rights to the ladies. Blissfully unaware of the bravado that is going on the females continue with their snacking, the suckling of their young and their general everyday grooming routines. 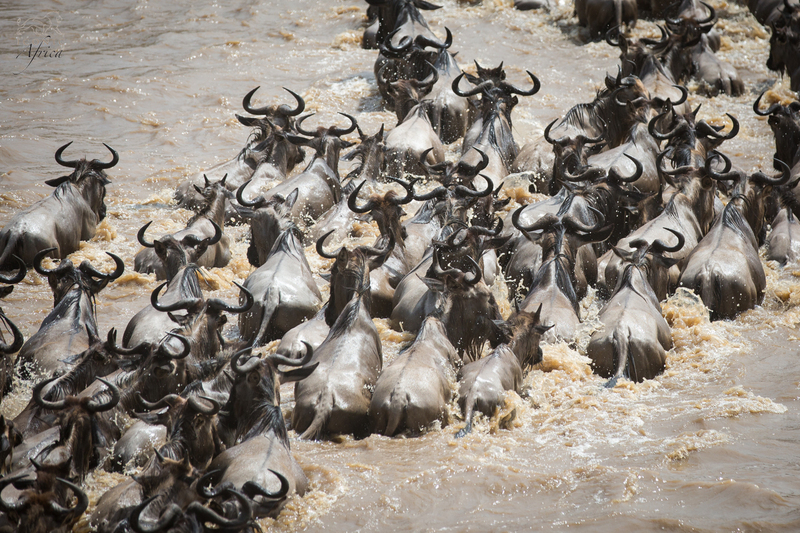 Despite all this swagger and chaos there is still a great sense of community amongst these animals, a sense of a common goal as they sluggishly but deliberately begin the journey from the Southern Serengeti up to the greener Mara in search of rain-ripened grass. 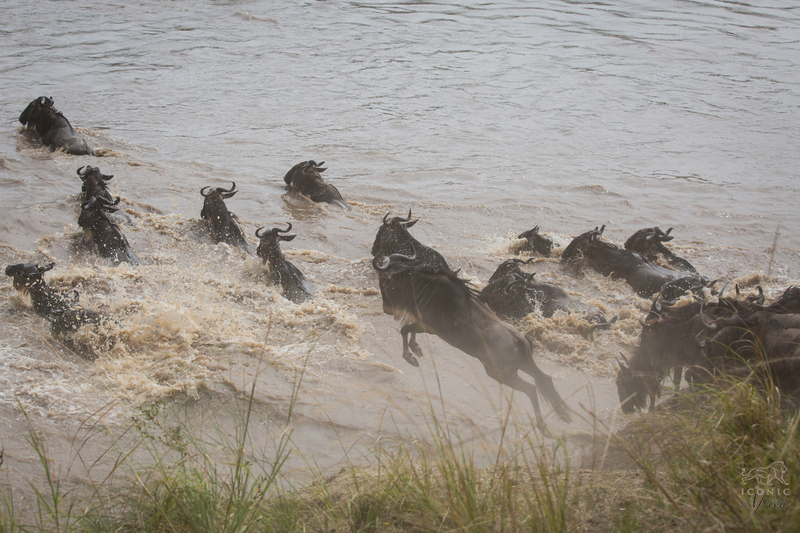 Very quickly a sprinkling of these white bearded wildebeest becomes a sizeable herd and soon the sea of green around us becomes one of black. Every now and then a few zebras join the party and even the odd Thompson’s gazelle or topi tags along. We sat there for what seemed like hours watching the idiosyncrasies and interactions of these strange creatures. We even began to feel part of the herd and as if we should start heading north too. They would wander up to the river’s edge and we would think ‘they are going to cross… they are going to cross’ and then… they’d simply turn around wander back and continue eating, mating and frolicking. You certainly have to be patient and you have to understand that when nature is putting on a show… it doesn’t do it to any sort of schedule. The sun had passed overhead and the heat was really starting to get stifling. 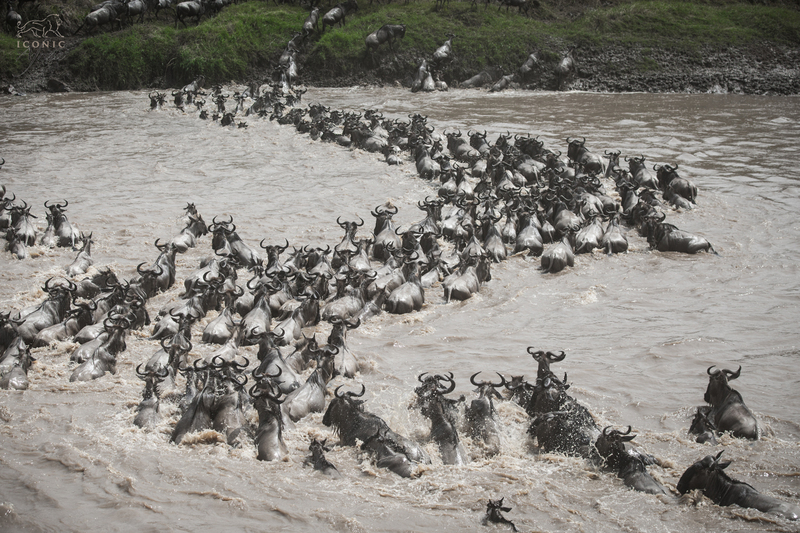 When all of a sudden the silence was broken with a very frantic, crackled, ‘Wanaovuka… wanaovuka….’ Swahili for ‘they are crossing, they are crossing’ came bursting through the radio! Our expert guide Lucas, sprung into gear and with great excitement drove us off road, at full speed, towards the edge of the river. Bumping around and holding on for dear life we lurched towards the edge peering over the scrub at every point to see if we could get a glimpse. Screeching to a halt we bundled out of the car, cameras in tow and sprinted down to the edge of the cliff. And there it was… we had made it… we were witnessing it. 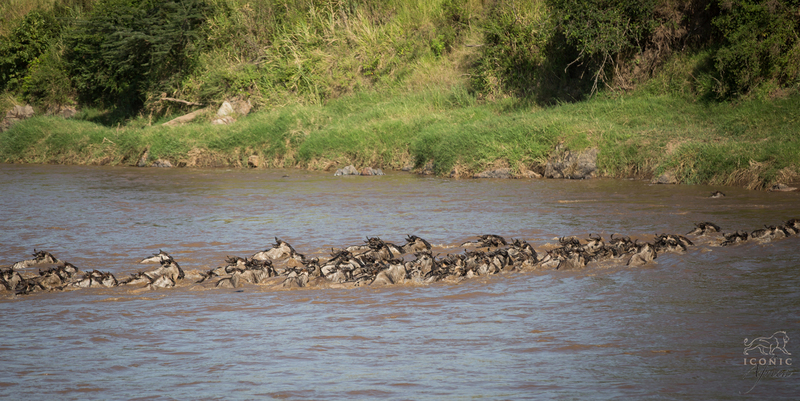 Disbelief overwhelmed us as we watched 5000 wildebeest scramble down the steep cliff and launch themselves into the muddy water with the utmost faith that they would make it to the other side. They swam in hoards, tenaciously fighting the current and climbing up the far bank to join their teammates in tangible jubilation. The noise is deafening, the panic palpable. It literally is survival of the fittest. They just keep coming… and just keep swimming… you cannot believe how many there are and how determined they are to get to the other side. And then, to our absolute surprise some of them seem to have had enough of the other side already and despite all the perils of crossing and decide to come back! Logic has no place here but you still watch with awe. It can be scary and rather ‘touch and go’ at times as the little ones struggle against the current with each stroke… you watch them, holding your breath, and you will them to make it to the other side. Twenty endless minutes passed and as the last lone male clambered out the other side we breathed out a sigh of relief. Thankfully for us, they had all made it and there were no casualties. Although it would have been exciting, I particularly, was rather relieved that the crocodiles had been a bit slow off the mark. We had done it, we had witnessed the wonder of the great crossing and my goodness was it worth very second we had waited. From day one of our trip there had been an unspoken anticipation and excitement about whether or not we would be lucky enough to see one. You actually never know, that is the unpredictability of nature, and as a result the prize is even sweeter a gift that no one can ever take away from you. It’s Africa at its best, nature showing off and certainly something every human should witness. For more information on the migration click here.